What a wonderful tutorial – this is truly a great inspiration! I fell in love with the clamshell pattern in quilts and was thrilled to find this crochet pattern. The Clamshell Pattern by Sandra Paul is not only a beautiful crochet afghan piece with a beautiful stitch. This blanket is super sweet and colorful. The color combination is amazing and the photo tutorial extremely helpful and appreciated by so many. 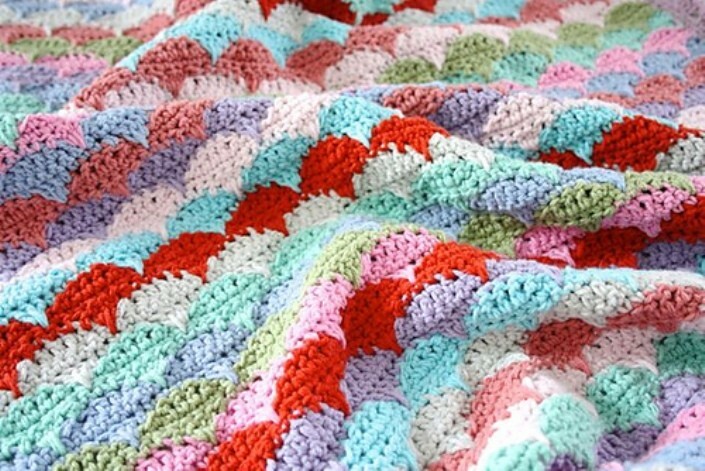 It’s easy to make a beautiful blanket when instructions are so clear and easy to follow. Step-by step tutorials are always great to use as a quick guide. Also, this blanket pattern is such a great pattern for using up stash. After admiring quilts made in the clamshell pattern, I wanted to recreate the same effect in crochet. It’s a great pattern for big blankets, baby blankets, cushions and lots more besides. The written pattern is at the end of the photo tutorial, scroll down to the bottom to find it. Thanks to Sandra Paul for article inspiration and featured image. Jessica Leigh Easter this is another easy afghan to make. Once you get the pattern down, it is easy to watch a movie and crochet. The color combinations are endless and so are the choices of yarn and hooks. I think you will like this one. Pattern. Might be OK. I don’t like the colors. I’ve made this. It’s beautiful.